As of April, 2009, there are 6 exam locations coming up: Canada, Germany, Argentina, UK, Netherlands. If you know of an upcoming conference near you, let us know (send email to www AT bsdcertification.org) and we'll get in contact with the conference organizers to see if they will provide a time and place for the BSDA exam. We'll bring the pencils, you bring the know-how. We're in the process of reviewing the exam for the next version. Our psychometrician, Dr. Sandra Dolan, has provided us with a report of the exam results for the first year. BSD subject matter experts, drawn from the BSD community have helped modify some the the questions to increase the accuracy of the exam. The Winter 2008 DVD is out. 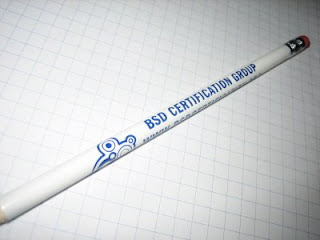 This edition includes the QEMU virtualization software (and the AQEMU front end) that enables working with multiple BSD systems at the same time. Additional information on using the software is here [bsdwiki.reedmedia.net]. Purchasing a DVD is an excellent way to prepare for the exam, helps fund the exam development effort, and helps keep the cost of the exam globally affordable (still just $75USD). Planning for the BSD Professional Exam (BSDP) is underway. We will start with a Job Task Analysis (JTA) survey similar to the JTA we produced for the BSDA exam. The BSDP JTA should be ready in a month or two, and we will announce the survey through all our regular media channels. Stay tuned for the next level.